Rambling Moose: Maintenance Lizard and Guard Gecko Protect Us! Deep in the jungles of South Florida, there exists a technological marvel. This marvel is a wired telephone system. We are graced with the ability to pick up a device, press a few buttons, and then speak with a person of our choosing. This system requires constant upgrades and maintenance. Many hundreds of miles of copper wire, electronic switches, and cabinets dot the landscape. These are all watched over by the little known Maintenance Lizard. They take over the Day Shift and are replaced by their Night Shift partner, the Guard Gecko. The Maintenance Lizard has full access to the technological marvel, caressing its workings with loving care, they help to make certain that no harm comes to the system. At night, the Guard Gecko replaces the Maintenance Lizard, removing unwanted pests like the Inventory Insect and the dreaded Construction Centipede that gets into the works and can cause all sorts of havoc with the fragile infrastructure. If found, the Guard Gecko will rid these pests with their great jaws and dispatch them with haste. Here, our Maintenance Lizard takes a rare break and warns me off into the jungle from whence I came. 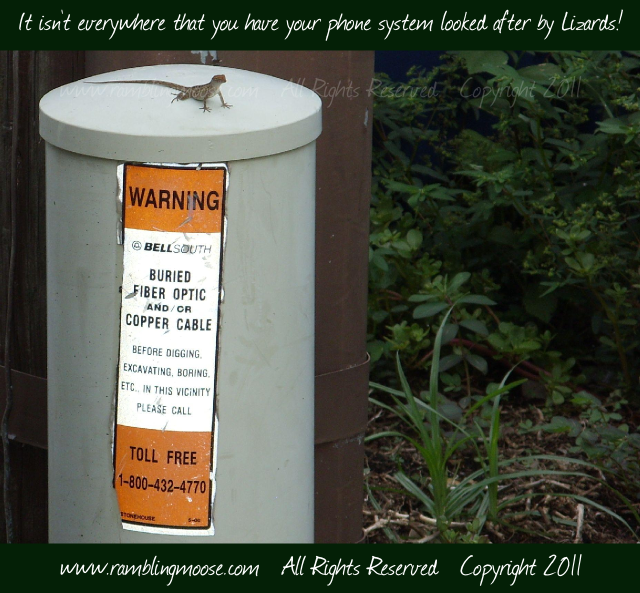 Work on, oh Maintenance Lizard, make South Florida safe for telecommunications for yet another day.